Teleport Tapestries are decorative wall hangings made of cloth, with unique images to the locations they take you to. They are great additions to your Wizard's castle, not just because they are a fast way to get where you want, but also because they make for beautiful interior decorations. 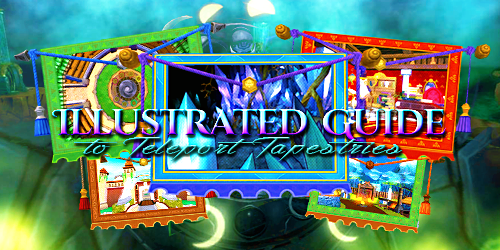 Currently, there are 44 different Teleport Tapestries available. They can be obtained in several ways and some of them are exclusive to Wizard101 Fansites, who usually give them away in contests. As of July 2014, most of them can be crafted, so you will find a list of all tapestries below and where you can get them. Exclusive to Stars of the Spiral. The recipe is sold by Eudora Tangletree. The recipe is sold by Eudora Tangletree. The recipe is sold by Captain Dartmouth. Exclusive to Mercenaries101 and Wizard101 Central. The recipe is sold by Zellozosia the HomeGlider. Available in the Majestic Bundle Gift Card. The recipe is sold by Padraig. The recipe is sold by Harker. Exclusive to Paige MoonShade and Wizard101 Central. The recipe is sold by Eudora Tangletree. Exclusive to Mercenaries101. The recipe is sold by Gearwise. Exclusive to Duelist101 and Wizard101 Central. The recipe is sold by Eudora Tangletree. Exclusive to Legends of the Spiral and Wizard101 Central. The recipe is sold by Zellozosia the HomeGlider. Exclusive to Art in the Spiral and Wizard101 Central. The recipe is sold by Gearwise. Exclusive to Legends of the Spiral. The recipe is sold by Padraig. Exclusive to Stars of the Spiral and Wizard101 Central. The recipe is sold by Balthazar Dragonthorn. Exclusive to Valerian's School and Wizard101 Central. The recipe is sold by Koyate Ghostmane. Exclusive to Spiral Radio 101 and Wizard101 Central. The recipe is sold by Eudora Tangletree. Exclusive to Ditto Monster and Wizard101 Central. The recipe is sold by Gearwise. Exclusive to Adventures of the Spiral and Wizard101 Central. The recipe is sold by Cantares Five Flowers. Exclusive to Spiral Radio 101. The recipe is sold by Eudora Tangletree. The recipe is sold by Kamal Sarhan. Exclusive to Valerian's School. The recipe is sold by Toshio. The recipe is sold by Pembaa. Exclusive to Mercenaries101. The recipe is sold by Padraig. The recipe is sold by Torald Wayfinder. Exclusive to Ditto Monster. The recipe is sold by Padraig. Exclusive to Ditto Monster. The recipe is sold by Petunia Floribund. Exclusive to Petnome Project. The recipe is sold by Felicia Worthington. Exclusive to Duelist101. It is also available in the Super Bundle Gift Card and sold by Roland Silverheart. Exclusive to Duelist101. The recipe is sold by Wul'yahm and it is also available in the Pharaoh's Hoard Pack. Exclusive to Paige MoonShade. The recipe is sold by Balthazar Dragonthorn. Exclusive to Wizard101 Central. It is also available in the Hawk Rider Gift Card and Arcane Builder's Bundle, and the recipe is sold by Eudora Tangletree. Exclusive to Wizard101 Central. The recipe is sold by Eudora Tangletree. House-a-Palooza 2013 promotional item. The recipe is sold by Eudora Tangletree. Exclusive to Valerian's School. The recipe is sold by Eudora Tangletree. Exclusive to Petnome Project and Wizard101 Central. The recipe is sold by Eudora Tangletree. Exclusive to Legends of the Spiral. The recipe is sold by Eudora Tangletree. Exclusive to Paige MoonShade. The recipe is sold by Eudora Tangletree. Exclusive to Petnome Project. The recipe is sold by Eudora Tangletree. Exclusive to Spiral Radio 101. The recipe is sold by Wul'yahm and it is also available in the Pharaoh's Hoard Pack. Exclusive to Frostcaller and Wizard101 Central. The recipe is sold by Torald Wayfinder. House-a-Palooza 2013 promotional item. The recipe is sold by Padraig. Exclusive to Wizards of the Spiral and Wizard101 Central. The recipe is sold by Cantares Five Flowers. Credits: Special thanks to Professor Greyrose, most Community Leaders and some Wizard101 members, for contributing to this guide!